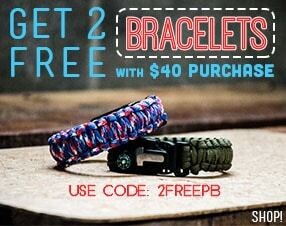 Two-Color Cobra Bracelet Cobra Bracelet Patriot Day Bracelet 1 Minute Survival Bracelet Adventurer Wrap Bracelets Crisscrossed Solomon Bracelet One little strand can go a long way! 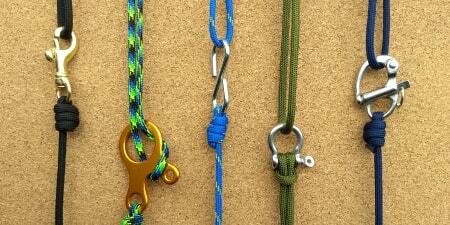 Adding this accent cord transforms a traditional Cobra into the Crisscrossed Solomon! 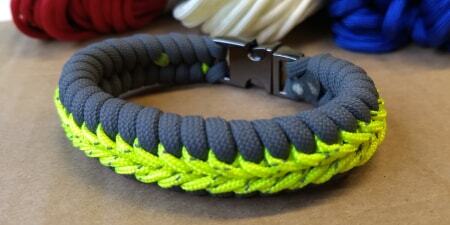 Curling Millipede Bracelet Have some fun with your paracord with this Curling Millipede bracelet! Dragons Tongue Bracelet If the cobra is just too thin and the Trilobite is too thick, the answer is Dragon's Tongue! This bracelet is a fun weave to show your team spirit. EMS Bracelet Click here to learn how to add a 3rd color to the Cobra weave! In this pictorial you will learn how to create this bracelet as a Thin Blue Line for a police officer or an EMS. Shark Jawbone Bracelet Inspired by the teeth of the ocean dwellers, this Shark Jawbone bracelet is sure to impress. Slithering Snake Bracelet The Slithering Snake is a neat bracelet that is perfect for Halloween or for everyday wear. Trilobite Bracelet If you're looking for a thicker bracelet than the Cobra, the Trilobite is for you! The Trilobite bracelet is a fun bracelet in one, two, or three colors. Double Fishtail Bracelet Click here to learn how to add a 2nd color the Fishtail! Rainbow Bracelet Take the traditional cobra up a notch with the Rainbow Cobra Bracelet! These small stripes can make a big impact. Thin Blue Line Bracelet Click here to learn how to add a 3rd color to the Cobra weave! 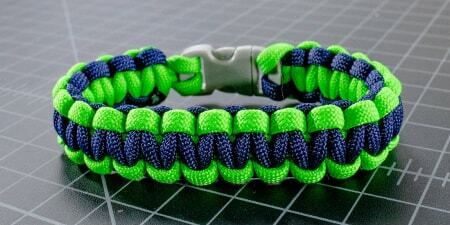 In this pictorial you will learn how to create this bracelet as a Thin Blue Line for a police officer or an EMS. Breast Cancer Awareness Bracelet Learn how to incorporate an Awareness Ribbon into your Cobra bracelet. Honor your loved ones with this quick and easy bracelet. Cobra Belly Bracelet Click here to learn how to add a 3rd color the Cobra Belly! Same concept, with an added flair. Double Tatted Bar Bracelet This unique bracelet is an easy way for you to stand out from the crowd. Looks best with two colors. Reverse Stitched Solomon Bracelet The Reverse Stitched Solomon is an easy way to jazz up the traditional cobra design. Endless Falls Bracelet With this weave you get a bracelet that seemingly never ends! 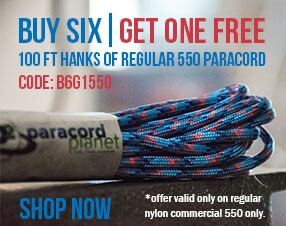 It's a fun, easy, and dainty weave that is sure to impress. 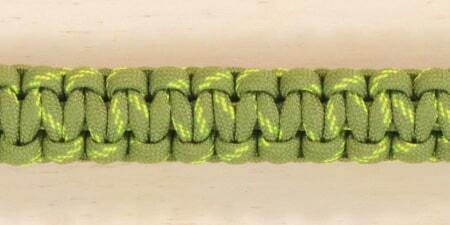 Cross Crooked River Bar Bracelet This is a fun and interesting weave you won't want to miss! It can be a nice pop of color for any outfit! Tri Cobra Braid Bracelet Make this fun and unique bracelet with all basics you already know! 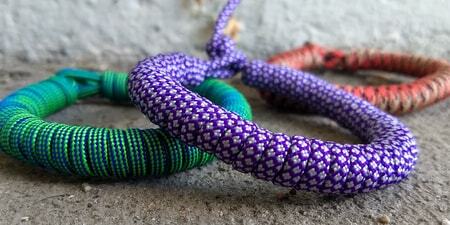 The Tri-Cobra braid is an easy bracelet to stand out. Celtic Heart Bracelet Perfect for the lady in your life! This cute bracelet is a unique way to show your love. Stitched Solomon Bar Bracelet The Stitched Solomon Bar Paracord Bracelet is an easy bracelet with a unique look! Its stitched look makes it a cool single or double color bracelet. A neat look is red and white or brown and white for baseball and football inspired bracelets.